UP Cabinet Decision Latest News 2018:- Check Below Latest Cabinet Meeting News and its Decision on Recruitment, Health, Budget and Any Scheme, Pariyojana Implementation. SBI SME Recruitment 2018 Apply Online for MBA, CA, Law Passed Candidates to fill 119 Jobs Application form of Special Management Executive before Last Date. 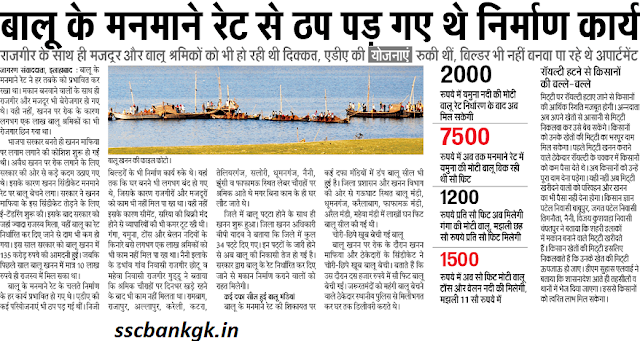 UP Balu Khanan Latest News in Hindi to Check Balu, Morang Rate in Uttar Pradesh. Balu Rate in UP Today. For More News Check Latest News of Morang Balu Rate District Wise. Supreme Court JCA Recruitment 2018 10th pass Applicant Are invited to Apply Online for Two posts 78 (65 JCA, 13 CA) Junior Court Attendant and Chartered Accountant. For More Details of Age Limit, Selection Process and Eligibility Criteria Read Below. 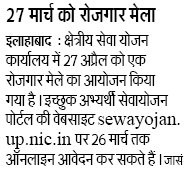 UP PMS Doctor Recruitment 2019 Apply Online For PMS Chikitsak in Swasthya Vibhag, 7,000 posts are registered to Elect on Contract. They will be placed in permanent when they completed Age Limit, Educational Qualification and Selection Process etc. UP Post Office Postman Recruitment 2019 Apply Online Daakiya Jobs in Uttar Pradesh, Total UP Postal Circle Postman Vacancies is 700. For more details Like Age Limit, Educational Qualification Read Below. Post Office 10th Pass Jobs 2018 Check Job Profile of Postman MTS, Mailguard with its Eligibility Criteria, Qualification. For More details read below article. UP GDS Merit List 2018 pdf of Selected Candidates, Gramin Dak Sevak Cut Off Marks, Latest News, and UP GDS Merit List Releasing Date 2018. Allahabad Rojgar Mela 2018 Apply Online for Job Fair in Allahabad to 10th, 12th and Graduate Pass in Any Stream before Last Date completed. UP GDS Admit Card 2018 For Upcoming Gramin Dak Sevak, UP Post Office Interview Call Letter, Merit List of UP GDS Admit Card Released Date 2018.